Saxophonist Jay Beckenstein believes that Spyro Gyra's longevity springs from the fact that "we've always taken our own path, moved to our own drummer without regard for industry trends, even if the music tends at times to go beyond the current flavor of the month." Clearly, the ageless band's sense of adventure has never gone out of style, because more than 20 years after Spyro Gyra's eclectic blend of soul, jazz and world beat influences first conquered the Buffalo club scene, their innovative sound‹which was the forebearer of today's smooth jazz‹is still one of instrumental music's most creative and popular forces. And the band plays on. Spyro Gyra celebrates their 20th release in 20 years (and seventh on GRP) with 20/20, whose clever title addresses not only their great legacy, but also the clear vision they have for a future whose possibilities are still endless. As Beckenstein notes, "When I think of the 20/20 concept, I see it as 20 down, 20 to go. I feel we're a well-oiled machine just coming to the top of our game." While the ensemble's last three albums, Dreams Beyond Control, Love & Other Obsessions and Heart of the Night strayed at times beyond the core Spyro Gyra focus by using outside vocalists and/or arrangers, 20/20 is more of a homegrown band project. "It never hurts to try new approaches and experiment with your direction," Beckenstein says, "but what I've realized is that we're all in it because we love all kinds of music, and the five principal members are capable of playing in a wide variety of styles." Speaking of his bandmates Tom Schuman (keyboards), Julio Fernandez (guitars), Joel Rosenblatt (drums) and Scott Ambush (bass), Beckenstein adds: "I am surrounded by many talented songwriters, and giving everyone an opportunity to contribute keeps things varied and exciting from track to track. Since we started, we considered ourselves part of the jazz heritage, intent on improvisation, strong soloing and the ability to stretch out. While you could categorize some of our music as smooth jazz, our albums have never been about one mood. By staying close to our high energy roots, we're suddenly being accepted by some of those people who would have dismissed us before. After 20 albums, we still have things to say. But, it's still growing out of that original vision." 20/20 kicks off with Beckenstein blowing sly and seductive on his breezy, Latin flavored "The Unwritten Letter," an elegant romance featuring easygoing percussion and a jazzy trademark Schuman piano solo. A thick, funky bass groove lays the foundation for Fernandez' fiery blues/rocker "Ruled By Venus," which offers a snappy interplay between Beckenstein and Fernandez, a soulful organ solo by Schuman and brassy excitement of The No Sweat Horn Section (Barry Danielian, Scott Kreitzer and Randy Andos). Beckenstein then explores the many facets of modern love on the title track, beginning with Fernandez's eloquent acoustic guitar solo before easing into moody, soundscaped atmospheres (with Beckenstein's silky sax) and finally, no holds barred, horn driven R&B. Beckenstein dedicates the hypnotic, orchestral flavored "Three Sisters" to his three young daughters, then carries the lush, folksy melody of James Taylor's "Sweet Baby James" over a swaying country and western feel. Scott Ambush's throbbing, almost avante garde fusion gem "The Deep End" proves a jamming showcase for the band to strut its love for jazz as well as blues/rock (with the help of trumpeter Chris Botti), while Fernandez engages the tender side of his artistry on the sweet Latin flavors of "Together." In case there was ever any doubt that Spyro Gyra couldn't capture the intensity of their live performances on disc, 20/20's final three tracks show that the party translates just fine. Former band member Jeremy Wall contributes the playful rolling rhythm samba "Dark-Eyed Lady," featuring Manolo Badrena's hot jungle percussion, former group vibist Dave Samuels fanning the tropical heat and a seductive vocal chant section. Samuels' amazing soloing style also stirs up the bubbling Latin carnival "South American Sojourn," a free for all fiesta featuring the No Sweat Horns at their most sizzling. Finally, Chris Botti's smoky trumpet dashes in and out of Schuman's spacey synth riffs and traditional flavored jazz soloing on the slamming funk of "Rockaway To Sunset," which closes the set on a high note. Looking back over the 20 recordings and the more than 20 years which have told the successful story of Spyro Gyra, Jay Beckenstein reflects: "No matter how many years we've been doing this, at any given moment I have to pinch myself and realize just how lucky we are to make a living doing something this joyous and fun. It's so rewarding to know that people buy our albums and attend our concerts year after year, and that we're always connecting with new fans as well." Appealing to millions of fans was the furthest thing from the group's minds back in Buffalo in the early 70s, when Beckenstein led a revolving group of musicians who made a modest living bouncing around the club scene. When a club owner needed a clever way to advertise the increasingly popular group, the saxman jokingly came up with "spirogira," a term he recalled from a college biology course. When the term was misspelled as "Spyro Gyra," a legend was born. Spyro Gyra's first project was funded through a lease agreement on a sixteen track studio while its members worked more commercial outside gigs and sold studio time to pay the lease. Local independent Amherst Records offered them a deal, then transferred their contract to Infinity Records, a division of MCA (their label throughout the 80s). Within a year, they recorded the platinum album Morning Dance, which spawned the Top 40 hit single of the title track in 1979. The band built on their early accolades as contemporary jazz pioneers with a brilliant live show that has since made them one of instrumental music's top attractions. 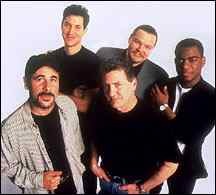 GRP took on MCA's jazz roster in 1990, and Spyro Gyra has been a popular label mainstay ever since. Although vibes and marimba master Dave Samuels contributes to a few tracks per album, the former member left the touring ensemble and his status as a full timer three years ago. "In fact, prior to 1983, Dave was a guest musician on our albums and didn't tour with the group. So, in a sense, we've only returned to our roots. Dave's participation on our recent projects reminds me how great an improvisor he is," says Beckenstein, "and I'm glad we can still have his coloration in our music. Since his departure, the biggest change is that our albums feature more of Julio's guitar. He stepped to the forefront more and has had more opportunity to stretch out. Despite the changes, the overall feeling and concept of the band has remained constant." Spyro Gyra's ability to stay fresh creatively while continuing to build its large fan base is a testament to the band's refusal to rest on its numerous laurels. "The trick to staying creative is giving people their money's worth," Beckenstein adds. "We try to make music that is accessible and enjoyable but which is also outside a bit, adventurous. We're always looking to do something more and better than before, and that is an increasingly difficult search over time. The key has always been finding our personal voice, finding what stimulates us and expressing ourselves through these outlets. It's all about the large scale emotional connections you make through the music." Combining a nod to past successes with a keen sense of its relevance in the presence and optimism for a creatively fulfilling future, Spyro Gyra's vision as a contemporary jazz powerhouse is, as it has always been, a perfect 20/20. After more than two decades, their legacy burns brighter than ever. It must have been fun in the '70s, when young, developing musicians could play whatever came naturally to them, without worrying about tailoring it to fit into the parameters dictated by radio formats. When they played instrumental music, it didn't really matter if it was jazz, pop, pop-jazz, fusion if it was melodic and adventurous, chances are it would get airplay and the audience would love it. Twenty years ago, long before the coining of the radio-generated buzzwords "New Adult Contemporary" or "Smooth jazz," Spyro Gyra was jamming, having a grand old time creating their own instrumental hybrid, incorporating elements of R&B, Latin, Brazilian whatever struck their collective fancy into an infectious sound which just coincidentally became a forerunner of today's popular style. Here in 1997, with their latest album 20/20 marking the amazing feat of their 20th release in 20 years, we can view their remarkable output as a true contemporary jazz legacy. Bandleader and saxman Jay Beckenstein can look back and remember a time when he and keyboardist Jeremy Wall were just jamming for fun. He can marvel at the unexpected resulting success just as we all can, but rest on his laurels? Not even close. A few listens to that still restless, still evolving and ever exciting sense of adventure on their past few albums (1994's Dreams Beyond Control, 1995's Love & Other Obsessions, 1996's Heart of the Night, and the new 20/20) makes it clear that, even after all this time, Spyro is still a vital force in the world they helped create. "Aside from one of the most amazing live shows in instrumental music and killer, killer songs, Spyro Gyra endures as an audience favorite because they created an original style that sounded like nothing that came before it," remarks Art Good, creator and host of the popular, nationally syndicated Jazz Trax show, who recalls first playing their breakthrough hits "Morning Dance" and "Shaker Song" as a mainstream AC deejay in the late 70's. "Whatever Jay had inside him, whatever sort of influences led him to this smooth mixture of styles, it came out as an original voice. Not many artists can honestly say they've never copied anyone, but Spyro Gyra can." Accordingly, whether he intended to be a sax god or not, Beckenstein's inimitable sax style has led him to become somewhat of an elder statesman in smooth jazzdom, his influence touching up and coming performers with the same overall impact as Grover Washington Jr. and David Sanborn. Boney James, one of the genre icons with top-selling silky sax albums like Backbone and Seduction, recalls pulling the car over and calling jazz station KKGO in Los Angeles the first time he heard "Morning Dance". "In my late teens, I was into Chick Corea, Herbie Hancock and Jeff Lorber at the time, but I'd never heard anything like that before," he reflects. "For a young sax player trying to find his way and figure out how to integrate my love for pop, soul and jazz, learning to play fusion was a bit complicated at the time. Spyro Gyra combined accessible pop qualities with happy uplifting tones, bringing together elements of jazz, Latin and R&B effortlessly and unconsciously. What they're doing with electric jazz and unique instrumentation has always had a timeless quality to me. I bought their first record, danced around my bedroom, picked up the sax, played along and never looked back!" Beckenstein hears tributes like that, shakes his head and happily realizes that despite the long history, there is no clear end in sight to the magic that is Spyro Gyra. "What could be better than this?" he muses. "We still get to play music that our hearts are involved in, untainted by the world around us." Getting Boney James to boogie in his dorm and setting the instrumental world ablaze were the furthest things from Beckenstein's mind in Buffalo circa 1974 when he and keyboardist Jeremy Wall developed their little ensemble on off nights from the gigs that paid real money. Born in Brooklyn in 1951 to an opera singing mother and a dad who had practically every old jazz 78 in existence, Beckenstein grew up on Charlie Parker, Lester Young and "every jazz record made before 1950." Calling his background "generational" (i.e., Motown, Beatles, jazz), he gravitated first to R&B, playing with enlisted soldiers on the army base nearby in Germany where the Beckensteins moved his senior year. He had met Wall a few years earlier, and, later, back in the States, the two spent summers in college playing outdoor concerts together. "It was a free time then, and we did a cross fertilization of Ornette Coleman, Grateful Dead and The Stones, a rock band with horns," Wall laughs. Though Wall was out in California studying music at Cal Arts and Beckenstein was experimenting with avant-garde and classical sax, piano and clarinet at the State U of New York in Buffalo, the two knew they would eventually join forces. It happened not long after both graduated, when Wall moved to Buffalo and they starting their pro careers clubbing around town with some of the city's hottest R&B and blues acts. "Not many people know it, but Buffalo was like a mini Chicago back then, with a smoking blues, soul, jazz, even rockabilly scene, of all things," Beckenstein muses. "After being confined to classical music for so long, it was heaven. I was in the horn sections around town, backing some great vocalists." Spyro Gyra (a misspelling of spirogira, a scientific term Beckenstein jokingly gave a club owner as the group's name) began life on an off-night, when he and Wall set up on stage at Jack Daniels and began fooling around with instrumental music, tossing in everything from Earth, Wind & Fire and Marvin Gaye to Weather Report and the Miles Davis records Beckenstein remembered fondly from high school. Instrumental covers of R&B tunes were all the rage, and the Beckenstein/Wall experience combined those with a few originals, just for fun. In Wall's words, their sound was a real "gutbucket of rhythmic tradition. We did simple music and esoteric stuff. It all came together, this oddball mix, until we found a middle ground, our own groove." "Don't forget the interminable Dead-like solos we were taking," Beckenstein cracks. "We were the kings of self-indulgence, but eventually we earned our right to charge a quarter at the door. It was a complete shock when word of our psychosis got out and we started packing them in!" The overall vibe of the band evolved into a more focused ideal when then teenager Tom Schuman joined the band as second keyboardist (Wall left the live band in 1979, but has been assistant producer and written tracks for every album since). Beckenstein knew they were onto something, but wasn't sure what just yet. During the day, he turned his attention to the production end of things, and partnered up to do production with Richard Calandra of the local band The Posse. Using insurance money from Calandra's recent auto accident, Beckenstein and Calandra formed a company to record hot, developing local R&B and folk acts, and bought blocks of studio time to sell to these acts. One of them was future funk "Super Freak" superstar Rick James, whose first album featured Beckenstein in the horn section. In return, James helped fund Spyro Gyra's first album. Because the band's rep in Buffalo was strong enough to elicit local airplay, Beckenstein had the idea to capitalize on listener response in Buffalo, Cleveland and Rochester, pressed 500 records himself and started selling them out of the trunk of his car. Then the band put together a commercial for a local TV station and started selling more and more. "When I listen to that recording, I hear seeds of the music that made us popular," Beckenstein says. "It was pretty innovative at the time, I guess, a strange but still accessible blend of jazz, R&B and even Caribbean music. It's funny how people didn't know what to make of it then, and now it's so ubiquitous." The Caribbean sound came with the help of vibes and marimba master Dave Samuels, a New York city musician who was playing in town in a local club date. Beckenstein thought he could add a tropical effect to "Shaker Song." "I didn't know who they were, but I heard what they were doing, and realized that my sound and personality would be comfortable in that setting," recalls Samuels. "As they became a recording entity and then a popular national act, they'd call me to contribute year after year, doing studio work and occasional dates till I finally joined their touring ensemble full time in 1983." He stopped touring with them in 1993, but like Wall, still contributes to each album. An early obstacle on their road was Elvis' death, because every record plant in the country was churning out The King and had no time to keep pressing funky jazz stuff. But Spyro stuck it out and soon caught the attention of Lenny Silver, who owned a local record store chain as well as Amherst Records. He offered them a distribution deal, and the first album went on to sell 70,000 units. Silver transferred the deal to MCA/Infinity, and in 1979, Morning Dance, the album and the single, went through the roof. Boney James started dancing along with the other million or so people who eventually bought the album. "It was something in the alignment of the stars," Beckenstein laughs. "We were on a new label, and they really focused their resources on promoting us. Radio was open-minded at the time, but we never could have imagined that success. For whatever reason, 'Morning Dance' for all its happy, bright and tropical sweetness, became a classic, and touched a public nerve. Best of all, there were so many other textures on that album, listeners knew we were far from one dimensional." Though their subsequent success ensured that they'd be anything but one hit wonders, that song was like Chuck Mangione's "Feels So Good" the trademark, must-play track both live and on the radio. And now, twenty years later, Spyro Gyra's audience still wants to hear the tune that endeared them to the band. Or, as Dave Samuels adds, "Longtime fans love to come back and hear what reminds them of a certain period of their lives. They connect with it now as they did then, looking back on a special evening or event. The music was always played at a high level, for sophisticated folks, and I think everyone always got the feeling they were seeing a tight, well-rehearsed ensemble who really cared." While so many of today's smooth artists seem to have been created of the format, by the format and for the format specifically, Beckenstein is proud to realize that Spyro Gyra and artists of their generation were the innovators around whom radio rushed to create a formalized genre. Somehow, they responded to what Samuels calls the "Spyro Gyra Salad Bowl." "When we first started," Beckenstein recalls, "a lot of the jazz purists got on our case about calling what we did jazz and now it's funny to hear us getting respect from the same people. Like, wow, what you guys did was so much more intriguing than some of the stuff they hear today. Purists tend to be protective of their art form, and at first they didn't understand a band mixing in all these extraneous elements. "But," he adds, "the reason I got into jazz at all was the freedom it gave me from the strict structures of pop. It's ironic that it's more the jazz community who is insisting on certain rules or forms in order to be considered jazz. If that now means that you can't call what we do jazz, then call it something else. All I ask is to be judged not by style, but by content. Art manifests itself in a multitude of styles and contexts. Isn't that why we started to play in the first place?" Spyro Gyra's is music whose core and desire was never for strictly commercial purposes. There was no calculated effort to sell millions of records, sell out concerts throughout the world, and inspire a whole new generation of musicians seeking an eclectic road of their own. When Beckenstein and Wall first started jamming back in Buffalo, they just did it because it was a blast, pure and simple. They made lyrical, jazzy music for a few folks at Jack Daniels, developed a high energy live gig, one thing led to another, and suddenly, instrumental music was never quite the same. The fun was suddenly not just theirs, but ours as well. After twenty some odd years, when Jay Beckenstein takes a solo, then turns to his cohorts Julio Fernandez, Joel Rosenblatt, Scott Ambush and Tom Schuman as if to say, Are we having fun yet? Well, the answer has never been more obvious. Twenty years from now, when 40/40 is upon us, no doubt the sun of the "Morning Dance" will still be casting its rhythmic glow."